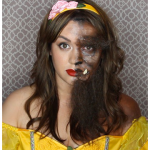 The last time we shared one of Kat Sketch’s awesome Halloween makeup tutorials here on the BuyCostumes.com Blog, she created one of the craziest and most unique looks we’ve ever seen: half beauty, half beast, and entirely amazing. Click here to check it out. 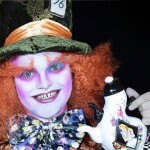 This time, Kat has recreated the makeup worn by Johnny Depp in his portrayal of the Mad Hatter, from the Tim Burton-directed adapation of Alice in Wonderland. Paired with our Mad Hatter costume and wig, it’s the ultimate way to complete the look. 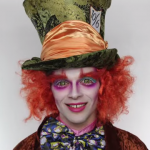 Watch her video below and learn to do this Mad Hatter makeup for your costume! To see more of Kat’s work, subscribe to her YouTube channel and check out her pages on Facebook, Twitter, Instagram, Tumblr, and Etsy. Hi guys! So, as you can tell by my bare face (and this fancy outfit with very fancy sleeves) today we are going to do a makeup transformation inspired by my one and only king, Tim Burton: his version of Mad Hatter from Alice in Wonderland. I’m obsessed with this makeup look and I’ve always, always, always wanted to do it for YouTube, so today is the day. We’ll see if we can cake on a white face with all these beautiful colors on the eyes and the contour of Johnny Depp’s cheekbones. Let’s see if we can do this, and I’m sure it’s going to be a ton of fun. But first, let me just tell you about this outfit. I got it from BuyCostumes.com. They have great, affordable prices, and they’re perfect for Halloween shopping because you can have it sent to you faster. I would honestly wear this jacket on an everyday basis if I could. We are first going to start off with a wig cap because we are definitely going to put on a giant orange wig later. 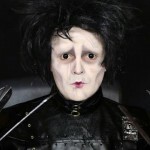 Now it is time to do one of the hardest makeups in my opinion, which is a plain white face. This is so easy to get splotchy and to get creases. I’m using Aqua Paints here and a beauty blender dupe. This one’s a little dingy because I use this just for Aqua Paints, but just use a disposable makeup sponge that is damp and patted in an Aqua Paint and do it on your face. If you have clown makeup it’s going to be very thick and sticky, and when you sweat it’s going to sweat into your eyeballs and hurt and burn. I cannot stand clown white makeup, but if that’s all you have, more power to you. Aqua Paints are pretty affordable now on Amazon and other websites. You want to do this in kind of a fast motion because if it dries up and you lift it with more paint, it will splotch and get weird textures all over, and you do not want that. You want to stop at your chin line and do a little bit on your ears. Once your face is completely white we are going to set it with Translucent Powder. If you do not have Translucent Powder, Baby Powder will work perfectly in replacement. We’re going to look like we just smeared powder doughnuts all over our face. (I want powder doughnuts now so bad and I can’t eat them. I’m allergic to life and powder doughnuts.) You can get a smaller brush with the Translucent Powder to set the creases in your eye and get those areas and crinkles. But, you want something that’s like a very magenta for this contour look. Now we’re going to use a bright blue eyeshadow. I’m using the Fuego Palette from Crown Brush, patting that on the top eyelids. They’re both going to be blue, and I’m going to perform some makeup magic and make my own color. First, using this Orange Eyeshadow, patting that on one side of my under eye, and then I’m going to take a very Rusty Sparkly Red from this Tarte Palette. I do not have a deep rusty burnt orange red color so I made it myself. For the bottom of the other eye, we are going to get this pink more of a little bit of a magenta eyeshadow. You want these colors all to be very saturated towards your inner eyelid and then have it fade out towards the white. Then I’m getting this purple color to do a nose contour, because the Mad Hatter’s contour is beyond fleek. It is so pretty it reminds me of My Little Pony mixed with like Fruit Loops inside of a bowl of milk. Now we’re going to get like a White Crème Makeup with a very, thin brush and do these bottom lash lines. Mad Hatter was going a little bit of Japanese kawaii with these lash lines. I put some of that color on my actual eyelashes as well – I’m studying this to the tee. You need a reference picture for this makeup look always on any makeup look in my opinion. Now to start off with his flaming bright orange eyebrows I am going to get one part Red, one part Yellow Crème Paint. If you already have Orange you are set already for this. But, I didn’t, so I mixed my own color, and I have one orange like a more bright tangerine and one of a darker reddish orange. Two different colors, we’re getting fancy! Then I’m getting a paint brush with the lighter orange, and painting on giant wispy hairs over your regular eyebrows and having it go down straight across your brow bone, a little bit lower towards your eyelid, because the Mad Hatter has some very straight, crazy, thick eyebrows that are very carrot orange and lovely. They’re so luscious! We’re going to go back with the darker orange color we made and do more hair like strokes. I’m setting this with some Orange Eyeshadow as well just to make the pigmentation just pop. Once you’re done with that you might want to set it first before you do this with the eyeliner to do in some shadow marks. Very lightly, light at hand to make these hairs look natural cause we are painting on top of the hairs of our eyebrows, so the shadows of the eyeliner marks on these eyebrows will just blend in the eyebrows with your natural eyebrow hairs just a little bit better. We want these eyebrows to look like they’re apart of Flame Princess. Shout out to any Adventure Time fans. Now I’m just getting some Tooth Lacquer Paint in the color Black. We’re going to do it on not both teeth, but one and a little bit on the other tooth. If you do it just on one tooth because if you do right in the smack middle on equal parts on each tooth you’re going to see an actual line in the middle of the black of the tooth. I feel like this is the one part I was oddly the weakest at because this is so hard for me to do. With Tooth Lacquer paints, your saliva kind of mixes with the paint. I don’t like the taste of it but it’s always a fun thing to do. Taking away some of that white paint with a makeup remover wipe, you’re going to leave some of it on some of your lips depending on your lip size because Johnny Depp has smaller lips than I do. Then I’m going to get this Pink Lipstick this is by the brand Revlon it’s there Matte Lipsticks. I’ll put the colors down below with everything I use in this video, but you’re going to get like a bubble gum pink and then layer it with a pretty Purple color it’s going to be like bubble gum berries on your mouth. It’s really cute especially with that gap in your teeth girl. 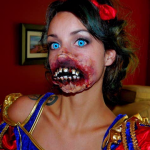 Once you think your makeup is complete it is time to put on the rest of this costume. This awesome outfit like I said is from BuyCostumes.com it has everything in the package. This outfit even comes with this giant bow and I had to put it on. I would just put on this bow every day because it has flowers on it and it’s cute. Then, it’s not necessary but I put on a wig. I say it’s not necessary cause this costume actually comes with a hat with another wig on it, but I really wanted a full, thick head of hair for the Mad Hatter because he has very luscious, very big hairstyle. We could stop there but I decided to put in some contacts. These are Bright Green ones there from Cameoeyes.com. These are a little more bright Green and less Yellow then I wanted them to be but maybe that’s me just being picky about the colors that I want on my face and makeup. Please do not put crazy contacts like this on children who are underage and if you never used contacts before because it takes some skill to use contacts like these. I don’t want anybody to hurt themselves. That completes our whole entire Mad Hatter makeup look. This is the Tim Burton version it’s one of my absolute favorites. I mean look at the colors they’re so vibrant and beautiful I hope I did temper ad justice he is one of my hero’s. I had so much fun doing this and making faces with it I could literally go to all my friend’s houses with this look, but don’t want to risk losing my friends because I don’t have that many and they would get too scared and freaked out about it. I just want to like frame this outfit and have it hanging up because it’s so cute. Sadly it is time to take this off. This is one of my most easier makeups to take off because you just need baby wipes. You don’t even need many makeup remover wipes because it’s just the face and it’s mostly water based paint, that’s the first layer. If you’re doing this makeup look for Halloween or any type of parties please set it with powder and a setting spray. If you do have like Ben Nye final seal is good and you can get it during Halloween at the Halloween stores, some of them anyways. I hope you guys enjoyed hanging out with me today. All the products I used in this video will be listed down below as always. Also please Tweet me and mostly Instagram me and tag me in your pictures of the makeup looks you do for Halloween or practicing for Halloween so that I can see them and I love all your beautiful faces and all your talent in recreating my makeup looks. It just really brightens up my heart and makes my day. Shop more Alice in Wonderland and Mad Hatter costumes on BuyCostumes.com.